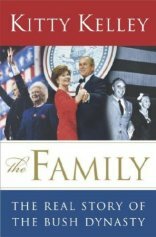 It is not just about George W. Bush alone, but a whole soap opera cast of his dysfunctional relatives, including his grandfather, father, mother, wife, daughters, brothers… Neil Bush’s ex-wife Sharon spills all the dirty laundry about the Bush family including Laura Bush’s marijuana use and George snorting cocaine at Camp David. Keep in mind nobody, not even Bush, or Frank Sinatra has ever successfully sued Kitty Kelley. She refuses to reveal her sources, but that does not mean she could not if challenged in court.